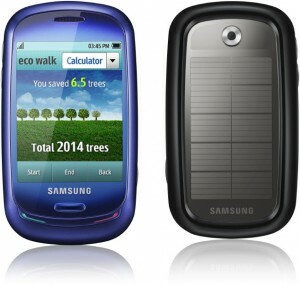 This mobile phone runs on solar energy because of the advertising campaign focused on the politics Samnsung environmental sustainability, introducing the theme "Green Living with Samnsung Mobile", pledging to protect the environment is terminal. Its design incorporates photovoltaic micropanels with which the mobile charge in one hour, in turn integrates a touchscreen and a multitude of programs. The housing of the phone is made ​​from recycled plastic water bottles, helping to reduce fuel emissions, and the charger from the device saves a lot of energy. Behind all these pros, a small drawback is that the battery talk time is 24 minutes.